There have been a number of box sets released containing a variety of L.P.'s, each one is listed below. 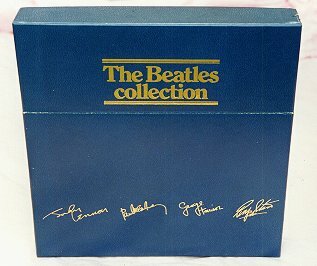 All the twelve original studio albums (all stereo versions), plus one "free" album of "Rarities" were presented in a blue box with embossed gold lettering. The "Rarities" album was mostly a compilation of B-sides, EP tracks and German releases, and was supposed to be unique to this box set ... I, for one, was not too impressed to see it released separately the following year ! The box also contains a free poster. See Rarities to see detail of the extra album. Beatle fans were not really getting anything new here. Of the 200 tracks (yes, exactly ! 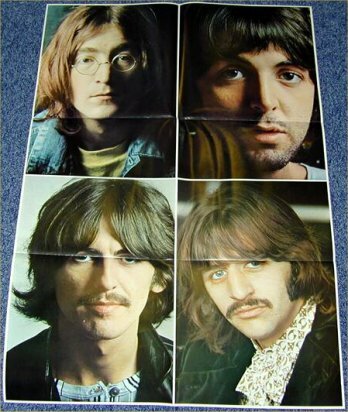 ), only one was duplicated, which was "Yellow Submarine", as this can be found on "Revolver" and the "Yellow Submarine" album. Therefore 199 different tracks were collected together within the box. The Collection had a recommended retail price tag of �:39. 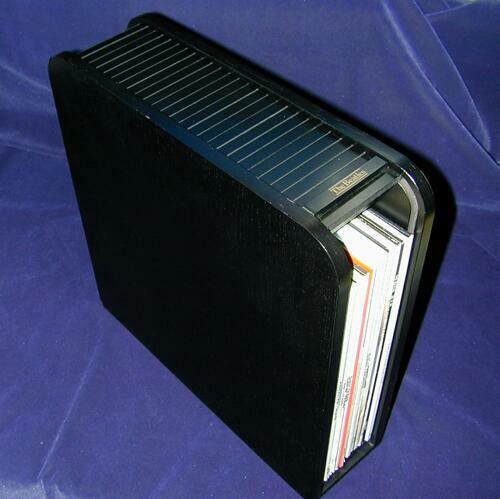 An 8 album (L.P. or cassette) boxed set issued by E.M.I. through it's "World Records" subsiduary. Unlike the Beatles Collection above released two years earlier, this set is actually new albums in new sleeves. The set was advertised vigourously in the national press from 5th November 1980 through into 1981. This means it was at the forefront right across the period of John's murder, and therefore sales must have been quite good, but as this box set was sold only by mail order the figures did not qualify for chart entry, and consequently are not publicly known. All the songs throughout the eight L.P.'s which were selected by Simon Sinclair, are arranged chronologically, and the covers reflect this, in that each has a picture from the appropriate period on the front, and a well-written biography of the period by Hugh Marshall on the rear. The Box itself is well designed looking like a wooden crate (see detail above), with plenty of information and sold for �:75. Incredibly, World Records were given some different mixes of some of the tracks, that were unavailable anywhere else at the time, and therefore made this box an essential purchase ... and anyway, it's a nice looking, excellent set ! Click on each of the thumbnails below to see the full detail of each L.P. The album box set was deleted in 1982. In July 1987 the box set re-appeared in eight CASSETTE format, which I also have ... see below. In 1982 E.M.I. had re-pressed and re-promoted all of the original mono albums. These releases were in-demand abroad, and so this boxed set was created and intended for export issue. 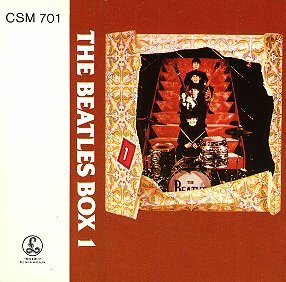 Whereas the earlier box set had been in a blue box, these albums were housed in a red box. BUT, the only one I`ve seen was in a dark blue/black box. 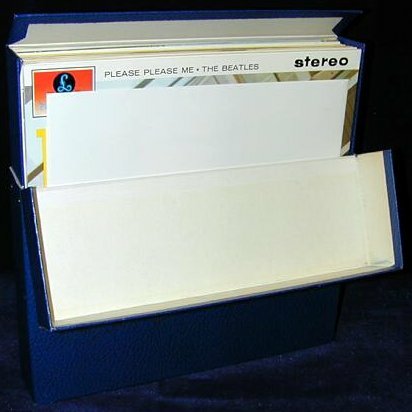 It contained 10 mono L.P.'s from "Please Please Me" through to "Yellow Submarine" (omitting "Collection of Oldies") and was available in a limited edition of 1000. 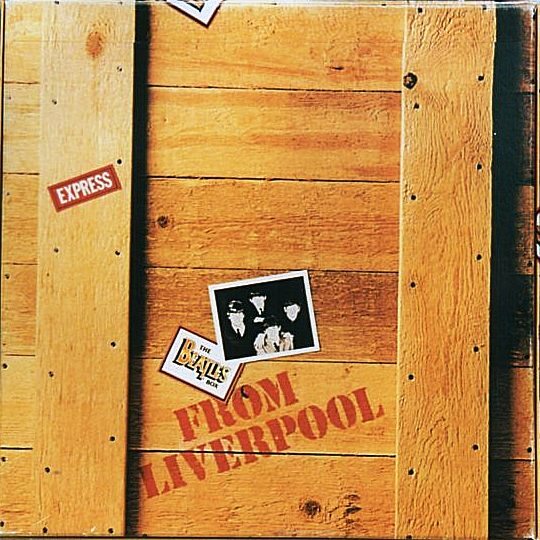 With the eight L.P. box set from World Records having been deleted in 1982, E.M.I. 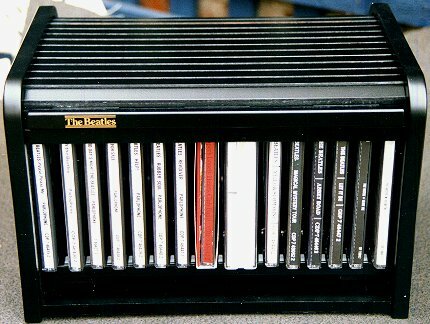 carried out a re-promotion in 1987 of the same collection of songs spread over eight cassettes in what they called "The Last Chance Edition" set. The box itself is identical, except for an extra numbered sticker on the front (mine is numbered 0207). The cost of this set was �:45 and was shipped on 15th July 1987. Inside my copy are two letters from E.M.I. with two questionaires and two envelopes to send the questionaires back. It only contained seven rather banal questions, so I did not bother to reply ... and now am glad of course, as it means the boxset is intact. CDS 7 91302 2 (C.D. Set). Whichever format you chose the set included the original 12 studio albums, plus, "Magical Mystery Tour", and the "Past Masters" releases. Therefore for the albums and cassette issues, you would get 14 albums (as "Past Masters" is one double album), and for the C.D. set you would get 15 C.D. 's as "Past Masters" is two separate C.D.'s. The set was issued in a wooden box with a 64 page glossy book. Each set included all the albums in new digitally remastered CD versions, with the first four albums in glorious mono. The distinctive black wooden boxes have been designed for style, durability and easy access with the original front opening roller shutter (like a bureau desk) made from hard-wearing wood composite. 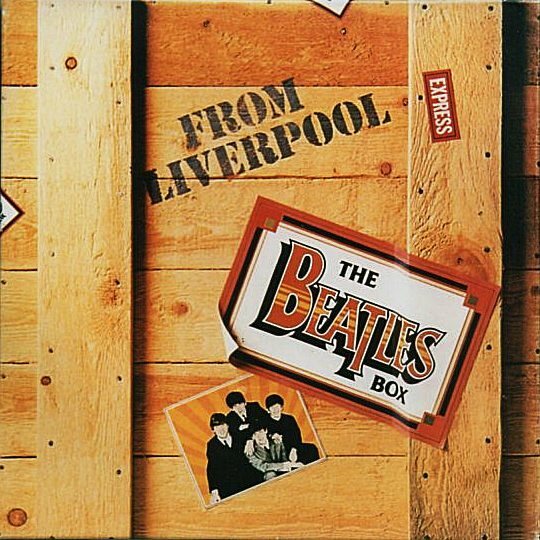 Unfortunately, once again no new tracks, and nothing that made the asking price an essential purchase, except so nice to have everything housed so handsomely and of course, as the Past Masters were included ... you have The Beatles entire output within on box. At the same time there was also another HMV special boxset with catalogue number BEA CDBOX1. This was a special limited edition box, limited to just 10,000, which was ostensibly the same as above, with 15 c.d. 's, but was housed in a lavish hologram box with added extras. 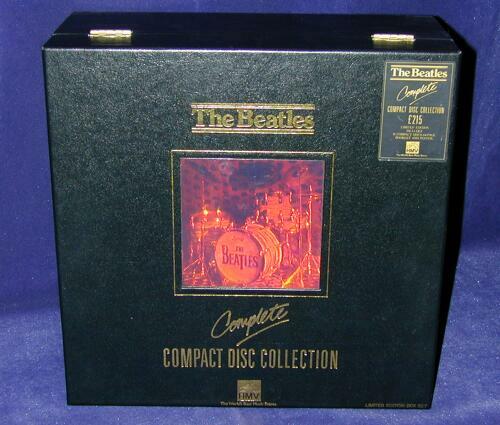 The CDs are protected in a deluxe black box, featuring an inset hologram image of The Beatles Ludwig drum set-up. There is a drawer compartment within the box containing a 60 page colour booklet, a poster displaying the Ludwig drum kit and an instruction sheet describing how to view the Hologram image to its full potential. THE BEATLES entire back catalogue has been digitally remastered (for the first time ?) and was issued worldwide on September 9, 2009. This brace of reissues also coincided with the launch of The Beatles: Rock Band video game. Each album will feature the original UK artwork, expanded sleevenotes and rare photos. For a limited period, each CD will also be embedded with a brief documentary film about the making of the album. 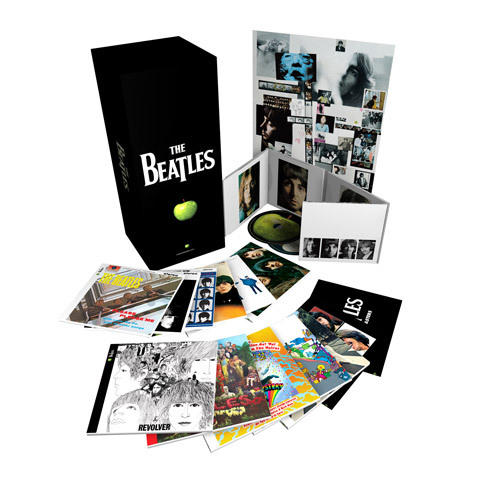 On the same date, two new Beatles box sets will also be released. In addition to the 12 original Beatles albums plus Magical Mystery Tour, Past Masters Vol. I and II (the 1988 B-side/alternate version compilations) have been collated into a single title. This is also the first time the Fab's first four LPs (Please Please Me, With The Beatles, A Hard Day's Night, Beatles For Sale) have been available in stereo CD format. Those 14 albums, along with a DVD collection of the documentaries, will also be available for purchase together in a Stereo box set. 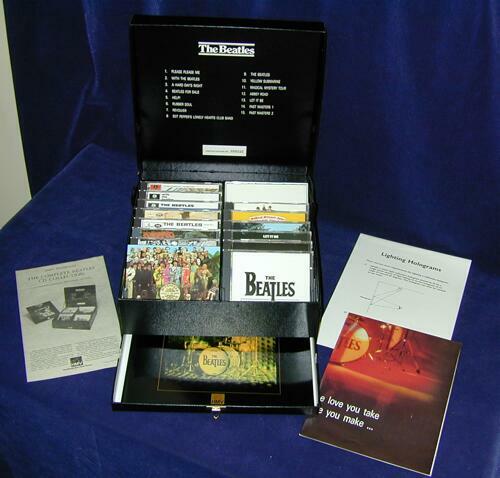 The Beatles in Stereo is a collection of CD's packaged in a hard black glossy lift top box with magnet clasp containing three panel digi-pak cd's with digital mini documentaries. 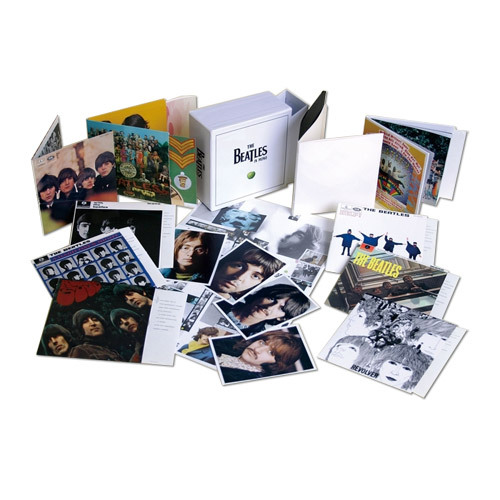 The Beatles in Mono is a second collection which will gather all of the band's recordings in their original mono mixes in a hard white glossy slip box. It features 10 of the band's albums plus a further two discs in the Past Masters mould. The mono Help! and Rubber Soul reissues will also include the original 1965 stereo mixes (not been previously released on CD). All will appear in mini-vinyl CD replicas complete with original sleeves, inserts and label designs. Also enclosed in the box is a glossy 44 page booklet with a foreword by Kevin Howlett, an in-depth analysis of the Mono Masters and some rare photographs. The initial pressing run of the Mono Boxset was limited to 10,000 copies in the UK (50,000 worldwide). As it sold out within a month, a second pressing run of 3000 was made in the UK ready to be available again at the beginning of November. Apple/EMI have not ruled out further manufacturing runs of the Mono Boxset if demand exceeds supply. 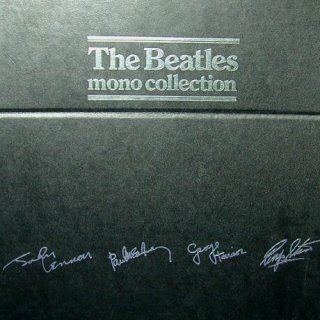 Unfortunately, once again no new tracks, and nothing that made the asking price of �9 for the stereo box and �9 for the mono set an essential purchase, except so nice to have everything housed so handsomely and of course, as the Past Masters were included ... you have The Beatles entire output within one box. But, I'm seriously not convinced that EMI and Apple have done this for the fans and it looks like a money-making scheme to me. They are selling product they've already made huge profits on and yet where is the big bonus for the fan ... again ? The first album chart issued after the release date had every album back in the chart singularly AND the two box sets in the official chart. The Beatles in Stereo entered the chart at number 24. The Beatles in Mono entered the chart at number 57. BOTH dropped out the Top 100 the following week. ©2007 Graham Calkin's Beatles Pages. All Rights Reserved.